Visitors can create a harmonic soundscape using this interactive sculpture, which takes its shape from the symmetries of the 12-tone musical scale. The Fifteen Puzzle allows visitors to grapple with concepts of parity, proof and impossibility. Located in the center of New York City, atop Madison Square Park, the National Museum of Mathematics (MoMath), attracts visitors of all ages and abilities with its broad range of offerings and a steady stream of activities. Since opening its doors in December 2012, visits to the museum have far exceeded expectations — and show no signs of abating. Glen Whitney, himself a Ph.D. in mathematics, opened MoMath with a goal of enhancing public understanding of — and engagement in — mathematics. While many people may find mathematics abstract and daunting, Whitney and staff are determined to show a side of mathematics that is enjoyable and accessible to everyone. “We’re bubbling with ideas for mathematical activities, so that everybody can find something that’s approachable — a hook to get them involved in the world of math,” he says. 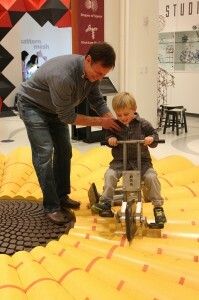 A visitor enjoys MoMath’s square-wheeled tricycle. MoMath demonstrates that mathematics has the capacity to fascinate and inspire, and to illuminate the world in unique and unexpected ways. Its elegant yet approachable exhibits allow each visitor to explore and learn about fundamental mathematical concepts in his or her own way. For visitors already in tune with the wonders of math, the museum provides opportunities to learn even more through interactive exhibits. And for the mathematically-challenged patron, whose view of mathematics may have been shaped by negative experiences in school, for example, math topics are explored in more dynamic and open-ended ways. The museum’s offerings are truly diverse: art enthusiasts enjoy the gallery of mathematically inspired pieces; children sit down to story time intended to spark their curiosity about math; and music lovers are happy to discover the museum’s math-relevant concerts. As the only mathematics museum in the country, MoMath plans to evolve along with the field of mathematics — and with their growing community of curious visitors. The Simons Foundation supports MoMath as part of its commitment to math and science education and outreach. Please visit the MoMath website to learn more, or to visit the museum itself.